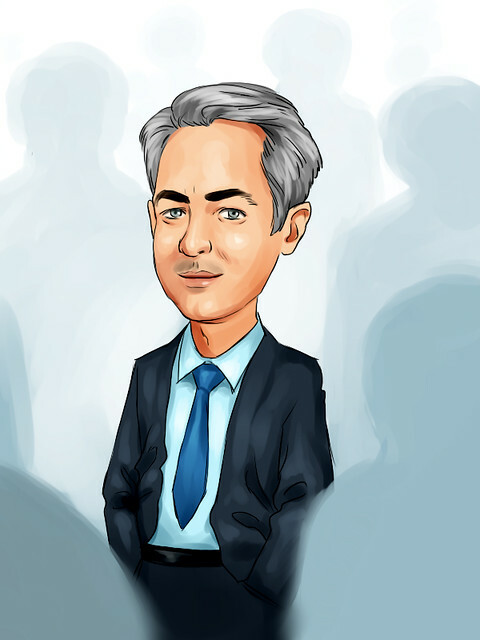 WHERE: CNBC’s “Squawk on the Street” – Live from Washington D.C.
CARL QUINTANILLA: Let’s get to D.C., where Sara is sitting down with a special guest from the spring IMF meeting. Good morning, Sara. SARA EISEN: Good morning. I’m excited for Jim’s guest, too, as well. Good morning, Carl and Jim. I’m here at the IMF World Bank meetings with David Malpass, three days on the job as World Bank President, and his first ever interview here as the World Bank President. Welcome. Congratulations. DAVID MALPASS: Thank you very much. I’m excited to be here and enthusiastic about the job. DAVID MALPASS: So the structure, I want to move forward with what is there, I don’t see the need for a reorganization. What we need to do is be very effective at the job that we’re doing. The mission is clear. Mission is poverty alleviation and shared prosperity, having countries do better, having them grow more. That’s a tall challenge and I just want to get on with that job. SARA EISEN: So, there was some controversy around your nomination and you did get unanimous approval by the board. Did you have to convince member countries, though, that you weren’t going to be a proxy for the Trump administration? SARA EISEN: So does that mean you’re not looking at the World Bank as a tool to further undermine or at least, confront China, as the Trump administration has been doing? DAVID MALPASS: So there are challenges facing the world in terms of how do you have transparent projects that are high quality, where the debt is transparent? China moved so fast that in some parts of the world there is just too much debt. That’s something that we can work on with China. They want to work on it. They want to see a better relationship with other countries and be part of the world system. So, I expect to be successful in that and to have a good relationship with China. SARA EISEN: One of the things we’ve heard you talk about before, though, is less lending to China, as it doesn’t need it as much as some of the other countries. Is that something you’re going to put to work? 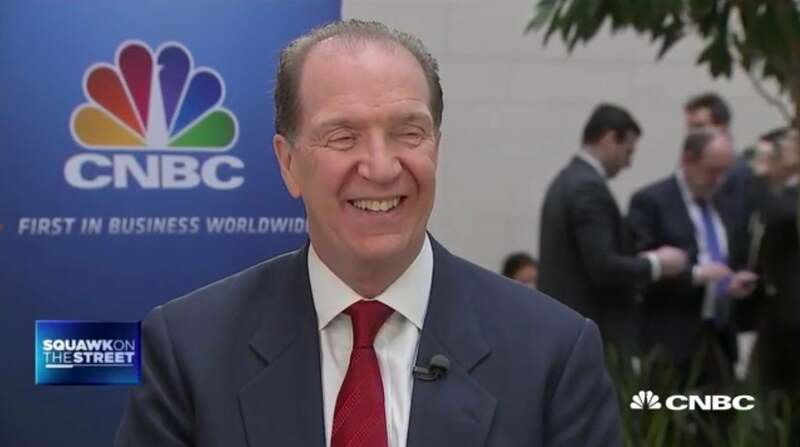 DAVID MALPASS: Yes, that’s embedded in the capital increase that was worked out early in 2018 with the -- with the shareholders of the World Bank. So China recognizes that its role as a borrower in the bank needs to diminish substantially. So that’s been going on in the lending programs and I expect it to go on pretty rapidly over the next three or so years, as the programs are reduced. China does want this relationship where the World Bank can provide technical assistance and be engaged in China. They welcome that role in certain areas, so we’re going to find areas that we can work on. One is poverty, and another is the environment itself. And so, China has -- faces big environmental challenges. The World Bank is good on those topics. And so, we can find things to work together as we wind down the borrowing relationship. SARA EISEN: It is about working together, and now that you represent both the U.S. and China of this organization, how do you deal with a conflict like what we’re seeing on trade and the tariffs, back and forth? How do you take a position? DAVID MALPASS: Well, there are bilateral issues that the World Bank doesn’t get into. What we do know is that more trade is good for countries. It is a way for -- and it is good within countries. One of the principle ways countries can advance economically is to have more commerce. And in the United States, that takes the form of commerce among the various states. That’s critically important to U.S. growth. China is doing the same thing within China, trying to have more trade around China. And it applies to international trade as well. So I hope to see— those are the world’s two biggest economies. I hope they can work out their issues and move forward with fast growth. That’s the goal here. DAVID MALPASS: World Bank did in January. And we are seeing slower growth. But as far as the U.S. and China, not so much of the slowdown is coming out of them, it is more coming out of Europe. That’s something that people can work on. The uncertainty coming out of Brexit is a challenge for growth in Europe. And it is very, very important that that growth begin to pick up. My own view is that structural reforms, whether in the U.S. or in China or in Europe can have a positive impact on developed country growth, and that’s very important to the base for developing countries. If we think about what would help developing countries, good programs in their own countries is good. Faster global growth would also help a lot. DAVID MALPASS: And I think it -- and so I think it is good for the world if countries can grow faster. The U.S. has lots of things that it can do to improve the growth rate here. But it has already, you know, accelerated substantially. The 3% growth has been continuing. And so that helps the rest of the world. That’s been a big additive to developing countries, to have the U.S. growing as fast as it has been. SARA EISEN: If you look at your mission here at the World Bank, fighting poverty, and then that’s a shared goal, it needs support from so many different countries. Is it harder right now in this environment where countries are putting up tariffs against each other, Britain is negotiating an exit from the EU, doesn’t that make your life harder? DAVID MALPASS: It is challenging as growth slows down. Now, you mentioned the UK. They have been a big partner with the World Bank in terms of development. They are constructive force. I’m hopeful that will continue very strong. I expect it to. And so, we’re looking forward to— the World Bank is looking forward to working closely with the UK on development issues. So, as we think about it, I think of the challenges as being good programs, country by country. Of course, the background, meaning global growth, is important. But the even more important part of it is how does each individual country and their leaders come up with good economic programs? That means price liberalization, that means trade liberalization, that means including women within the economy. They’re a key driving force of how countries can grow. That means a legal structure where the rule of law is respected. It means basics like water and electricity. All of those are things that the world bank can work with the country on, but the driving -- the driving pressure has to come from good country programs. SARA EISEN: I mean I’ve heard you talk a lot now about some of the goals and where you’re focused on. Have not heard you mention climate change, which is another one of those areas that seems at odds with the Trump administration and the mission of your new rule at the World Bank. SARA EISEN: So, you’re on board with what the World Bank has been doing? I mean, they have been divesting from coal projects and really focusing a lot of the funding on climate change projects. DAVID MALPASS: The World Bank has a plan, the Climate Change Action Plan, which I support and which I think is being very successful in interacting with countries at the level of climate. And I expect that -- those to continue. And so rather than people trying to look for differences, I think there is this big opportunity to recognize this is an urgent mission, it’s a very clear mission, it is pretty granular, meaning what does each country do to— each developing country do to make the lives of its people work better. Oftentimes that means letting markets function, the private sector enter, the role of women expand within their economy from a legal structure basis. All of those can be done and I think our unifying theme is they bring the world together. DAVID MALPASS: Yes, so we have put out in the IMF puts out, you know, a lot of detail on specific countries and how they’re coming -- how they’re coming along. And I can’t summarize for you, but one of the challenges is in the Middle East, North Africa region, with the exception of Egypt. Many of the countries are slow there. These are countries where the populations are growing fast and they need a lot of jobs. So I might single that out as a big challenge going on there. Of course, the slow growth in Sub-Saharan Africa, in some spots it is 1% growth at a time when the population even is growing faster than that. So these are very real growth problems that have -- are having a big effect. The response, I think, can be faster growth in developed countries, that would help a lot, but then better programs in the developing countries.